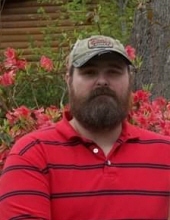 Walhalla–James Harley Cromer, 42, husband of Amanda Cromer, 615 Oconee Creek Road, passed away, March 23, 2019, at Greenville Memorial Hospital. Born in Oconee County, he was the son of Judy Jeannette Winkler Cromer and the late James Clyde Cromer. Mr. Cromer was a laborer in the construction industry. Survivors include his son, Mitchell Cromer of Walhalla; daughter, Meghan Cromer of Walhalla; sister, Christina Cromer-Moore of West Union; grandparents, Forrester and Christine Winkler and Hunt and Christine Cromer. In addition to his father, James is preceded in death by a daughter, Cassie Cromer. The family is at their respective homes. A message of condolence may be expressed online by visiting www.sandiferfuneralhome.com. To send flowers or a remembrance gift to the family of James Harley Cromer, please visit our Tribute Store. "Email Address" would like to share the life celebration of James Harley Cromer. Click on the "link" to go to share a favorite memory or leave a condolence message for the family.